Venture out of the city with trips to Orlando (Disney's Animal Kingdom, Walt Disney World Resort, & more). Pack the 18th (Mon) with family-friendly diversions at Busch Gardens. To see traveler tips, reviews, other places to visit, and more tourist information, use the Tampa tour itinerary planner. In March, daily temperatures in Tampa can reach 77°F, while at night they dip to 59°F. Finish up your sightseeing early on the 22nd (Fri) so you can travel back home. 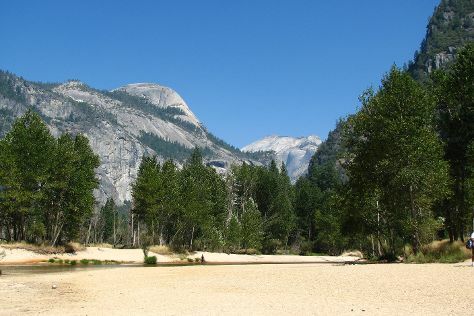 Kick off your visit on the 23rd (Sat): enjoy the sand and surf at Cathedral Beach Picnic Area, then identify plant and animal life at McGurk Meadow, and then explore the striking landscape at Glacier Point. Get ready for a full day of sightseeing on the 24th (Sun): see what you can catch with a fishing tour. Ask Inspirock to suggest an itinerary and make planning a trip to Yosemite National Park fast, fun, and easy. You can do a combination of flight and car from Tampa to Yosemite National Park in 12 hours. Other options are to do a combination of flight and bus; or drive. The time zone difference moving from Eastern Standard Time to Pacific Standard Time is minus 3 hours. Expect cooler temperatures when traveling from Tampa in March; daily highs in Yosemite National Park reach 53°F and lows reach 23°F. Wrap up your sightseeing by early afternoon on the 25th (Mon) to allow enough time to travel back home.